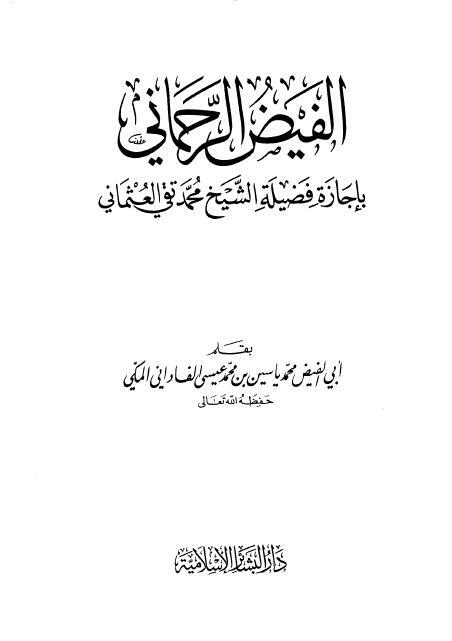 A Thabat work is essentially a collection of a scholar’s sanads to all the major and minor Hadith works. Since they consists of many chains, often Thabats can run into two volumes. The later the scholar, the more chains he will have to the books of Hadith. Courtesy of Shaykh Ehzaz Ajmeri. In it, Mufti Taqi sahib discusses several musalsal ahadith, and he mentions that he received their ijaza from Shaykh Yasin Fadani. please, i need a standard Arabic curriculum for my newly established school. i will be very glad if you can assist me in this regard. ma salaamah. I am not sure myself or anyone else reading may be able to help you exactly as you need. Still, if any of us could provide some information or link you to someone who has what you need, I am sure you will be obliged iA. It would be helpful, however, if you could provide more information about the type of school you run and what type of students you are aiming the curriculum for.